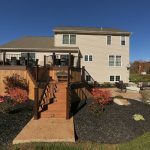 The Millers had just recently built their home and had a flat backyard with a patio door located several feet above ground. They had a set of wooden steps that led to the backyard from the door and were in search of a deck. Having received a few deck estimates and plans from other contractors, they came to us to see if we could install a decorative concrete patio. 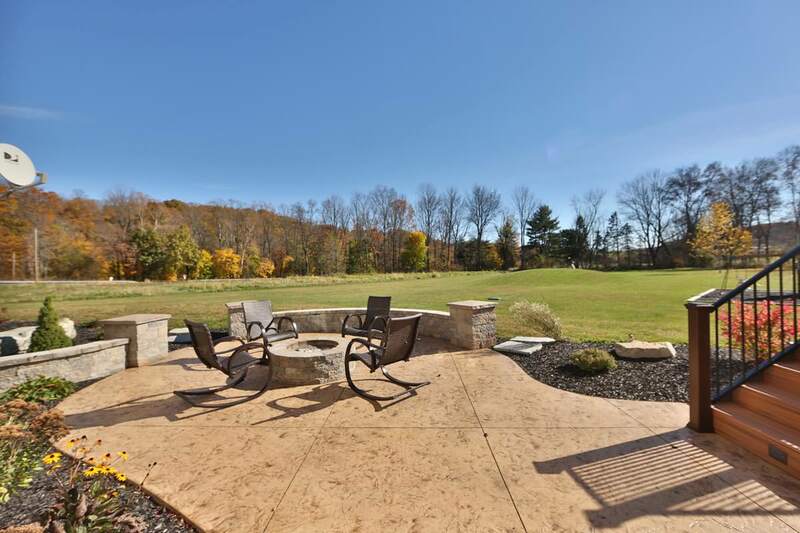 The Millers wanted a ground-level stamped concrete patio for entertaining and relaxing. 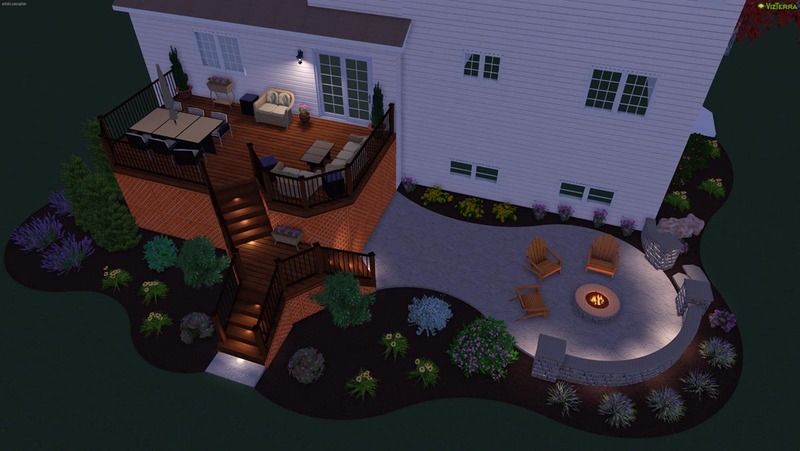 They were looking for a patio that included a fire pit and seating walls. 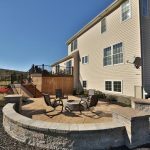 When we met with them on-site, we told them we could also design a custom-built deck and integrate it with a decorative stamped concrete patio – and not only could we design it, but we could install all of the elements as well. We told them they wouldn’t need to rely on different contractors for each project. 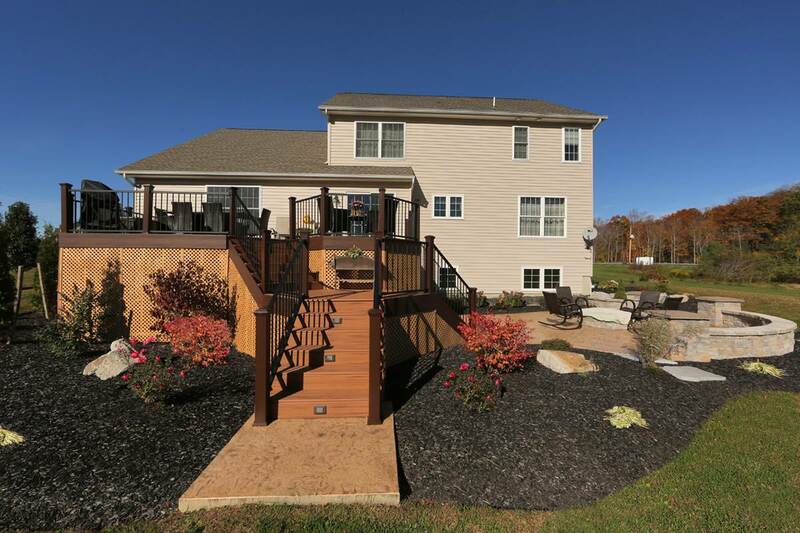 We designed a deck and patio layout that was unlike anything the Millers had received or even seen in photos. 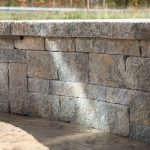 Based on our design, we became their contractor of choice for the entire outdoor living area. 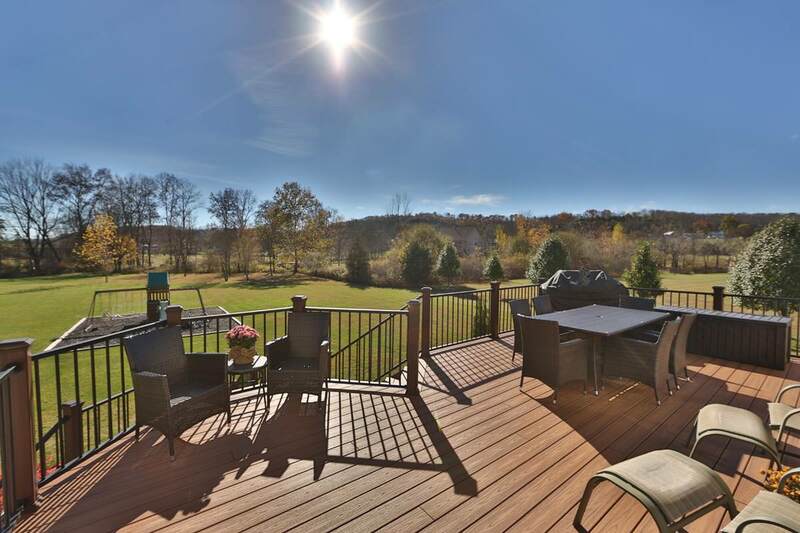 We began with a Trex deck seven feet above ground with two entertaining areas. 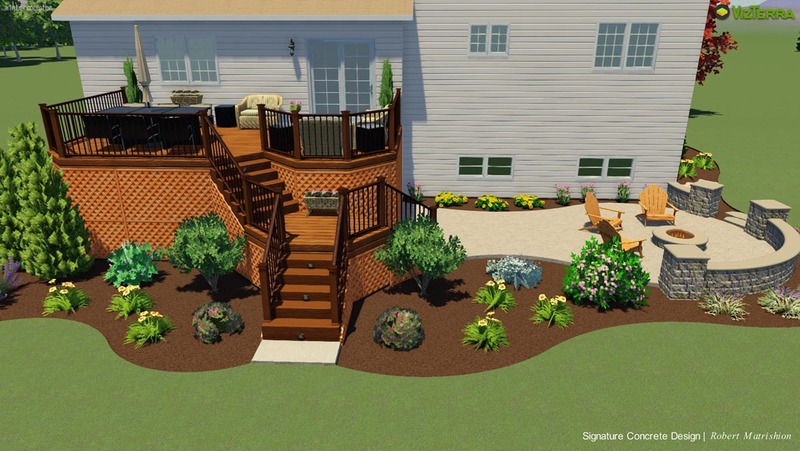 The three flights of deck stairs create a dramatic Y-shape staircase and provide access to the patio/fire pit area and the children’s play area. 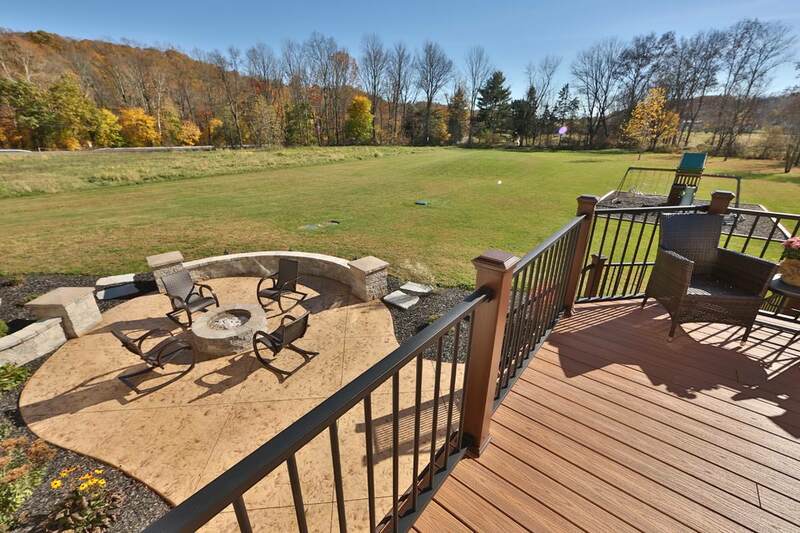 The fire pit space allows additional access to the lawn area of the backyard. We defined the fire pit space using a curved seating wall with pillars at each endpoint for dimension and architectural interest. 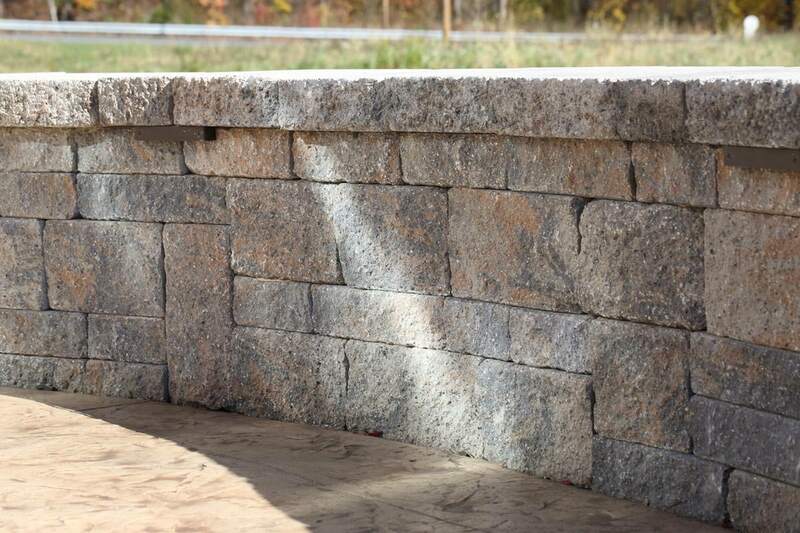 Constructed of Techo-Bloc’s manufactured stone, the fire pit, seating walls and pillars are all perfectly matched with the Trex material of the deck and our decorative stamped concrete patio. 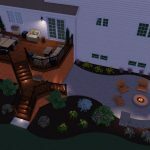 We designed an outdoor lighting plan to add safety and beauty to the outdoor living area. We added hardscape lights in the sitting wall and pillars. We installed step lights and post lights on the deck. 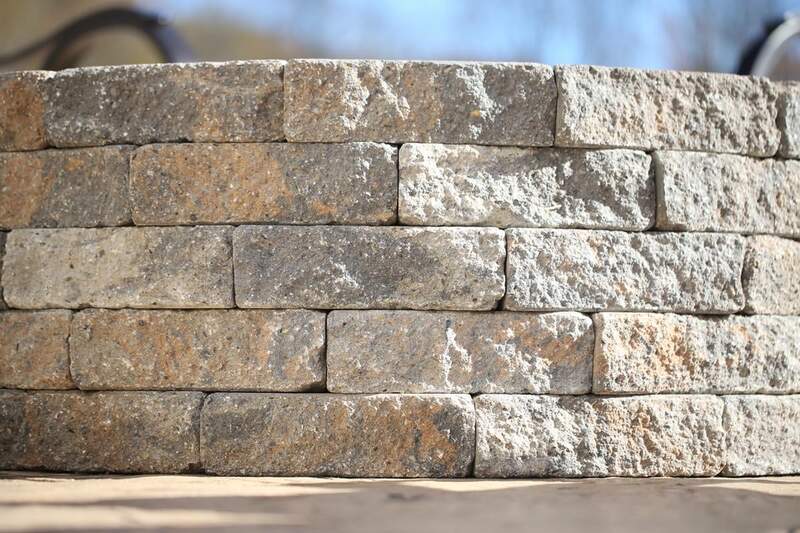 The hardscape lights define the outdoor rooms and add nighttime beauty to the outdoor space. 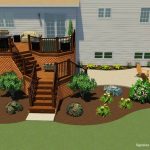 We finished the landscape design with curved planting beds around the patio and deck. 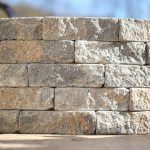 Using large boulders, medium-sized shrubs and perennials for color, we created the outdoor space the Millers always dreamed about. 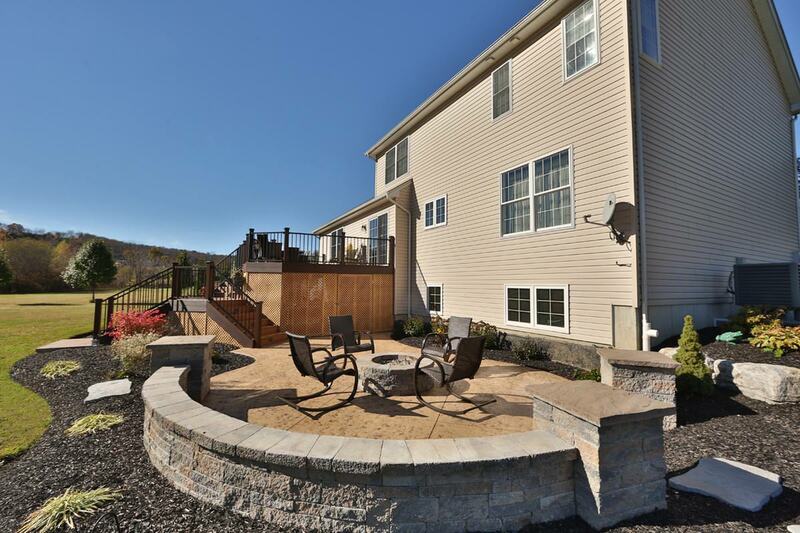 THE STAMPED CONCRETE COLOR COMBINATION: Beige creme color hardener with platinum gray release.